When Joan Brown began attending the California School of Fine Arts in 1955, she was immediately dissatisfied with her classes and the structure of art education in general. The first year was mainly given over to commercial aspects, such as design, and she was dismissive of exercises centered on technical skills. Just as Brown had all but decided to leave the school, she began a landscape-painting class taught by Elmer Bischoff, a leader, with Richard Diebenkorn and David Park, of Bay Area figuration. Brown discovered that Bischoff spoke her language, even though, she recalled in a long interview with Peter Karlstrom in 1975, “I had no idea what my language was.” He also gave Brown a singular piece of advice: “You don’t have to do things right, just paint from your insides, let it go.” By the 70s, and through to the end of her career, which was tragically cut short in 1990, Brown had fully embraced this notion: her rich interior life had become sole subject of her paintings. Brown died twenty-five years ago this month, leaving behind a substantial body of work, yet the trajectory of her art and art making, as well as her role in the Bay Area scene, is under-recognized. Solo exhibitions of her paintings are infrequent, and large-scale shows on the East Coast are unheard of. A small survey at George Adams Gallery in New York last spring, Joan Brown: Major Paintings from the 50s, 60s, and 70s, gave shape to Brown’s enthusiastic reception of Bischoff’s example, showing how she searched her immediate environment for things to paint. In a 1973 letter to the curator Brenda Richardson, Brown recalls that she “painted the first things I saw which was my dog and chair.” “Portrait of a Chair,” from 1958, was the only example of this very early work in the show. The intimate view of a chair and an empty easel is captured in a moody, autumnal palette and impasto brushwork. It’s curious that Brown chose to call the work a portrait, rather than a still life. The word typically indicates the representation of a person; here, it suggests that the chair has taken on human qualities and that Brown’s response to it is perhaps empathetic, especially given its proximity to the artist’s easel. Bischoff believed that painting was a psychological act. In a statement written in 1956, he declared that “the visible facts of the paint on the canvas clarify and refine the painter’s feelings”; the emotional quality of the figurative elements, or “the matter of feeling,” is dependent upon color and form. Brown found these lessons confirmed in the 1950s through art she discovered mainly in reproduction; it was work whose expressive capabilities surprised and inspired her. She admired the humanity in Francis Bacon’s paintings, for instance, noting to Karlstrom that “his sympathy, his anger, his understanding” were visible on the canvas. Of Rembrandt, she described the “tremendous exchange between the self and what he was portraying of himself on the canvas.” She also discovered that she could use surface texture to convey the emotional content of a painting. Paint handling provided as rich a vocabulary as the imagery represented on the canvas and could express an emotional response to a person, a memory, a situation. The late ‘60s saw a radical shift in Brown’s work. At that point, her paint handling was gestural, with broad, impastoed strokes — heavily influenced by the Bay Area’s interpretation of Abstract Expressionism. In June of 1965, she realized that she wanted “more conscious control” of her work, as she told Brenda Richardson in 1974. She stopped exhibiting for two years and had only one solo show between 1964 and 1970. Egyptian art had long appealed to Brown — she recalled, for instance, in her interview with Karlstrom, repeated visits as a child to the “ratty, rotten mummy” at the de Young museum, in San Francisco — and now she began studying Asian and Indian art at the de Young’s new Avery Brundage Collection, one of the foremost Western collections of Asian art. Both her style and materials would change as a result of her exposure to this ancient art. “Taste,” she opined in a 1982 interview with Lynn Gumpert, “is only what we are exposed to. What’s commonplace in one culture is exotic in another.” She eschewed the trowel and the palette knife and began using paint in washes. 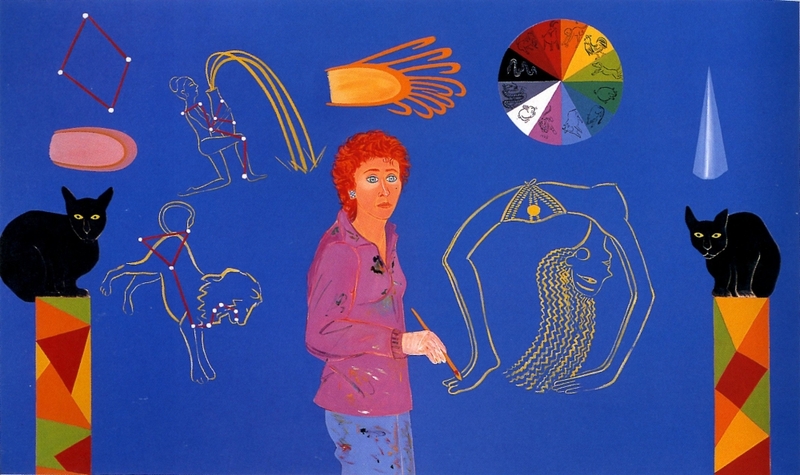 In 1970, she switched from oils to household oil enamels and painted frequently on Masonite; her surfaces became flat and her palette brighter. Her painting “Gordon, Joan and Rufus in Front of S.F. Opera House,” from 1969, reflects this change. The painting is a diptych, and Brown worked from a photograph of herself and her second husband. In the larger of the two panels, the couple stands on a sidewalk and faces the viewer, with two rows of trees receding into the distance behind them. The smaller panel depicts the dog Rufus in the bushes, on the outskirts of the primary scene (Rufus doesn’t appear in the photograph). The painting’s strong rectilinear elements disrupt one another: horizontal rows of bricks against the verticality of tree trunks; the strong parallel lines of red sidewalk blocks against the abrupt vertical break between the two canvases. The almost vertiginous illusion of distance is fractured, however, by the flatness of the bulbous, cartoony clouds, the mottling of the bushes and ground cover, and the frontal placement of the figures of Joan and Gordon against the picture plane, as though collaged onto this unreal setting. Rufus, meanwhile, sits obediently in profile, alone in his own panel. The division of the painting, with humans/culture on one side and an animal on the other, may hint at the dual qualities, “the conscious and unconscious states,” as she wrote in 1975, that Brown thought united people and animals. Egyptian art, with its stylized flatness and animal-human combinations, appears to have exerted a strong pull on Brown’s creative mind. But the illusion of depth combined with a perspectival flatness must also be attributed to her interest in Asian art. In “Twenty to Nine,” from 1972, a white subway-tiled wall imposes a cold austerity on a scene in which a woman waits for a companion who hasn’t shown. (I’m fascinated by the way the strict linearity of the tiles reflects not only the visual fact of the clock’s evenly spaced minute and hour marks but also the very notion of the exacting and ceaseless passing of time at regular intervals.) “After the Alcatraz Swim #3,” from 1975, juxtaposes the wall’s vertical lines with a geometric rug that runs along the bottom of the canvas like a ribbon. Brown shows herself in a patterned dress sitting in a stylized, three-quarter pose at a table; the scene has the feel of a folk painting. The placidity of the interior setting is interrupted by a painting within the painting, set against the wall behind Brown, which depicts swimmers struggling in the choppy waters of the San Francisco Bay. (Brown was an avid swimmer, and the sport is a frequent subject of her paintings.) This painting acts as a window into her memory, and not only do the irregular waves discompose the otherwise still scene, they seem to lap up and around the figure of Brown, tugging her into their disorder. In “Portrait of a Girl,” from 1971, Brown painted herself as a child. In “Self-Portrait with Fish and Cat,” 1970, she appears as an artist, in paint-smeared clothes. And in “Christmas Time 1970 (Joan and Noel),” 1970, she has included her young son. In each of these works, Brown is the primary subject and stands facing the viewer, looming large and wide-eyed at the front of the composition. The paintings are large, Brown said in the interview with Gumpert, so that she can be a “participant” in them. Their size, too, puts the viewer on par with the versions of the artist that appear there; she looks out at us, and we look back at her. “Portrait of a Girl” is the only one of the three that uses the third-person in its title, as though Brown sought some distance between herself and the child — her adult life and her childhood. The view is retrospective, so she is already at some remove from the girl in the painting (who, it should be noted, is composed from a composite of photographs of Brown). But the painting is also emotionally taut with a unique interplay of formal, material, and representational elements. Brown had been in the habit of putting her unconscious into her work since art school, when she made the sculpture “Fur Rat” (1962), the manifestation of a dream she had had in 1959. In “Portrait of a Girl,” a large Chinese dragon appears on the wall behind the child, his head looming over hers. His presence is menacing, but he may serve as a symbol, as the psychic, animal manifestation — protective or triumphant — of Brown’s feelings about her unhappy childhood. Adding to the dreamlike nature of the painting is the girl’s reflection in the dark, glassy floor, on which she appears to float. In 1970, Brown first introduced glitter and high-gloss commercial enamel paint into her work. Both elements help create dimension within the painting while emphasizing the imagery’s artificiality, as do the play of lines and depth in “Gordon, Joan and Rufus in Front of S.F. Opera House.” That tension — of both observing the painting’s dimensionality and being alert to its illusion — here equally describes the painting’s formal play and its simultaneous reconciling of Brown’s inner and outer lives. The stunning “Self-Portrait with Fish and Cat” uses the same faux reflection; here, the figure of Brown hovers over a gridded red floor. The flat, monochrome background is offset by the painterliness of Brown’s paint-splattered shirt, pants, and shoes, which create a vertical expressionist field in the midst of the larger composition. The background is a glossy oxblood hue that resembles the porcelain glazes she may have seen on Chinese pottery at the de Young, though she was also exposed to the work of numerous Bay Area and California-based ceramicists and painters in the ‘50s, ‘60s, and ‘70s, including Roy de Forest, Jeremy Anderson, and Ken Price, many of whom were using vivid color as an integral part of their art. This view of Brown as artist counterpoints the more circumspect view in “Portrait of a Chair”: where she was once the subject in absentia, she is now primary, her identity as an artist prominently on display. In 1970, Brown made a self-portrait in which her head is enveloped by a swarm of symbolic figures, items that were meaningful to her: dogs, birds, fish, cats, a teddy bear, cartoon characters, a Chinese doll, ceramics, a bride and groom, a rat. By the end of the decade, the symbolic nature of her work had developed a more metaphysical feel. On a trip to India in 1980, she was introduced to the Hindu guru Sathya Sai Baba, and in the early ‘80s, she produced a series of homages—“Homage to Sathya Sai Baba,” “Homage to Quetzalcoatl and Count de Waldeck,” “Homage to Akhnaton”—that made explicit reference to her deeply spiritual turn. Many paintings from the last decade of Brown’s life show her engaged in a dialogue with with spiritual concerns. In “Summer Solstice,” from 1982, she resides in the night sky, a constellation in the background, and is literally clothed in Sanskrit; the painting provides no hints about the meaning of the ancient writing, an indication perhaps that its significance is personal and that this journey is meant for her alone. The ten-foot-long painting “Year of the Tiger,” from 1983, incorporates all of Brown’s impulses. A grouping of heavenly constellations, a color wheel containing astrological symbols, and Eastern-inspired forms are arranged neatly in the blue background and are bordered on either side by twin pillars and two black cats who look out at the viewer. Brown herself stands in the middle, also turned toward the viewer, paintbrush in hand: she is inextricable from the scene, both within it and outside of it, its creator and its subject. Brown worked prolifically until her death, deepening her investigation into representing her inner life on the canvas — exploring the “animal” aspect of her consciousness, her relationships, and her interests. Her early work stands as evidence of the speed with which her own artistic language evolved and her fearless embrace of putting personal matters front and center in her art. “The exterior part of art is very, very fickle and very, very chancy,” she told Karlstrom in 1975, “so you concentrate on the interior elements.” This introspective yet intrepid artist felt compelled to show her “interior reasons” for creating a painting on canvas, and the two were inextricable: she was the art and art was her.